Mr. B. S. Nagesh has been with Shoppers Stop Ltd since its inception (1991) and led it to win the “Emerging Market Retailer of the Year” Award at the World Retail Congress in 2008. He was elevated as its Chairman in a non – executive position in 2019.He is the only Indian and the first Asian to be inducted into the “World Retail Hall of Fame” at the World Retail Congress 2008 in Barcelona. Mr. Nagesh is also the founding Chairman of Retailers Association of India, which is the country’s industry body. 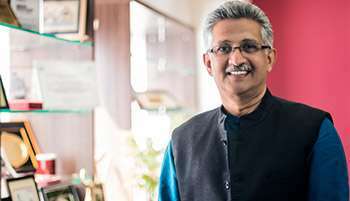 As part of his personal philosophy, Nagesh stepped out of allexecutive roles at the age of 50, and has set up a not-for-profit entity: Trust for Retailers and Retail Associates of India (www.trrain.org), with a mission of making a difference to the sales associate’s life – both at work and home. In the last five years, TRRAIN has provided livelihood for over 6000 people with disabilities and has trained and up-skilled over 25000 associates in retail. Retail Employees Day celebration and TRRAIN Retail Awards have become global events with millions of retail associates participating.